Be well prepared for your test essays! If you have to write test essays in examinations you should practice writing essays you might expect to find in those exams. Listen out for clues about what will be in your exam, subtle or otherwise. In my experience (as a student, teacher and examiner) teachers genuinely want their students to succeed! As an incentive to revision they often do drop hints about the exam, which may be more or less subtle. I know of one teacher who, as an experiment and presumably in the hope of improving everyone’s chances, told his class exactly what was going to be on the exam paper. Surprisingly the distribution of marks that year didn’t change much from that observed in previous years, suggesting that the students probably hadn’t taken him seriously. A former student told me that one of her teachers also told the class exactly what would be on the exam paper – but many of the students just didn’t believe he was being serious! It really is a good idea to take careful note of hints. Teachers mayn’t tell you exactly what questions are going to be in the exam, but they won’t pretend things are going to be in the exam if they’re not. You should also make sure you have copies of past exam papers, and of specimen papers or test essays if these are available (they may be all that’s available if the course is new). If you’re stuck then ask the teacher for papers or questions. He or she would prefer you to ask than to do badly in the exam. Furthermore they will probably give the same information to the whole class, since if you can’t find the information you need then probably others can’t. So you could be helping your class-mates by asking. To prepare for exams (any exams) you should start as early as possible, preferably months before, but certainly not only days before, and most definitely not the night before! Make sure you know exactly when and where your exams will be, and what the format of each exam will be. For more advise on exams and revision read Above Average: Exams. 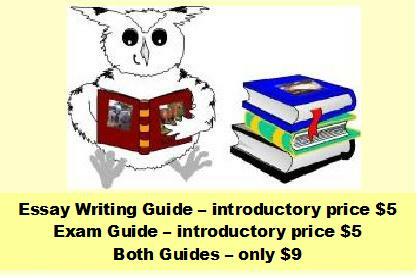 To revise for test essays first of all practice writing essays with your revision notes. If you can’t do this then you need to modify your notes until you can. When you’re happy doing this try writing the same essays with reduced notes, and then without any notes. Finally you should practice writing test essays to time: if you’re expected to spend 45 minutes writing each essay when you’re in the exam hall then practice writing essays in that time during your revision. If you typically finish before the 45 minutes is up then you need to find some more information relating to the topics of your essays. If you find it difficult completing your test essays in time you may just need more practice. Most people speed up after practicing! Alternatively you may be repeating yourself, or writing in a long-winded style. Another possibility is that you’re not answering the questions set. Make sure you understand exactly what’s expected of you – if you don’t then ask someone who does. If you still have problems you may be using too much information, although this is only likely if your extra information is from your own reading, rather than your class notes. See if you can say anything more concisely before cutting out the least relevant information, or editing examples. When you sit your exams make sure you always read all the questions, being careful to understand what’s being asked. Many students assume they know this before they’ve read the questions carefully. Consequently some answer what they think or wish had been set. Always check the back of the exam paper for questions. An otherwise intelligent student once told me that after an exam he’d turned the paper over to discover there were further test essay questions on the back! It’s easier to do daft things when you’re under pressure. If you use essay plans in your exams make them just long enough to jog your memory and get your facts in order. Don’t do as some students do and make plans that take up more space than the test essays themselves. It isn’t the best use of your time! Finally don’t contradict your-self in any exam answers. I once read a test essay that started off very well, but when half-way through the student started to contradict things she’d written earlier it became clear that she didn’t know what she was writing about! If you’re going to guess do it one way or the other. You’ll at least have a chance of getting it right.